WQA held a virtual Mid-Year Leadership Conference September 13-14, 2018 after Hurricane Florence forced the cancellation of the live event in Hilton Head Island, SC. The biggest production of the virtual event was the WQA Industry Update in which WQA President Chris Wilker, WQA Vice President Steve Ver Strat, Executive Director Pauli Undesser, WQA staff and several other members spread across the country presented the latest information on tariffs, PFOA, WQA Membership, WQRF and the WQA Boot Camp. Hosting the Update and all the meetings of WQA committees, task forces, sections and boards online allowed the important work of the MYLC to move forward, and opened up some of those meetings to people who had not planned to travel. If you have any questions or feedback regarding the virtual MYLC, please reach out to us at wqa@wqa.org. 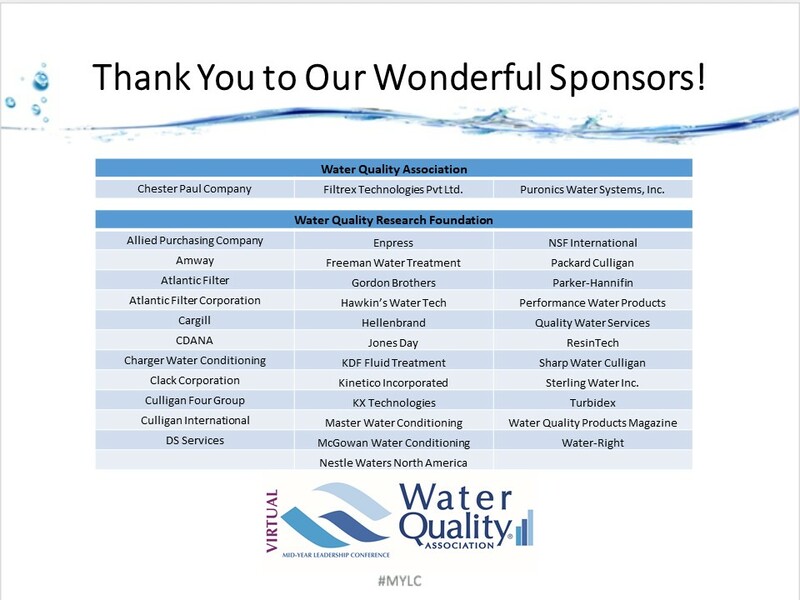 © 2018 Water Quality Association. All rights reserved.